Consumer Reports (CR) is one of the most trusted brands in America, due to its decades-long track record as a reliable source of unbiased testing and reviews of consumer products. But as the organization approached its 80th anniversary, a new leadership team faced the challenge of connecting with younger consumers: The average age of the subscribers to CR’s monthly magazine was 69 years old. CR’s leadership also sought to refocus the brand on the organization’s mission. Many people think of Consumer Reports as a magazine that provides useful information to make informed purchases of everything from cars and major appliances to sunscreen. But CR is a nonprofit organization that works with consumers not only to make smart purchases, but also to create a fairer, safer and healthier world. 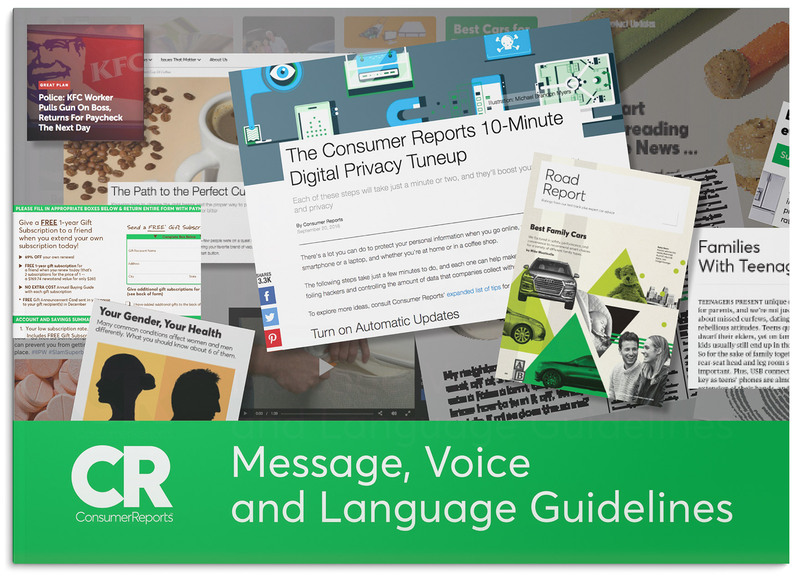 With nearly 8 million people either subscribing or donating to Consumer Reports and another 1 million signed up to participate in consumer campaigns, CR was well positioned to mobilize consumers in support of its mission. Market research exploring consumers’ hopes and values revealed an exciting opportunity for growth: a potential market of millions—including many Millennials—interested in aligning their consumer purchases with their personal values. In a survey conducted by the Hattaway team, nearly 9 out of 10 consumers said they wanted to make purchases that reflected their values. Seven out of 10 said they wanted their purchases to “make a difference” and “send a message.” CR saw an opportunity to connect with young people—and people of all ages looking to live their values. Mission-driven brands can connect with millions of people looking for ways to live their values. A Voice & Tone Guide equipped CR staff to "live the brand" in their work. Armed with these insights, the Consumer Reports team began building a new brand focused on the mission at the heart of their work. The Hattaway team used Winning Words language-testing research to help develop a tagline aimed at values-oriented consumers: Smarter Choices for a Better World. Getting the message right is only the beginning of building a strong brand. Different departments came together to create tools that would help CR’s team “live the brand” in their own work, including a Voice & Tone Guide with tips for integrating the new brand into their content and communications. Leaning into its mission promises to make Consumer Reports more meaningful to conscientious consumers, and potentially mobilize millions who want to create change through responsible purchases and policy advocacy. The new approach was well received by CR’s subscribers: In a survey, 87 percent approved of the new brand.